We have a Blog Candy Winner!!!!! launching tomorrow evening at 8pm. Is it a load of blue trays? Is it green and made out of cardboard? Actually this whole counter is stacked with storage systems! And can you guess where the new storage is buried? Ahh. The cavalry has just arrived. Don’t say a word Church! If I’d known you were coming, I would have baked a cake. Ah! I’ve just seen my glasses! Dawn Rogers and her Mum!!! They even sent in a spreadsheet with all the codes !!!! as soon as you email me your address. What are you like at tidying up? And how far away do you live???? PS.Since you like counting, how about another challenge? How many storage solutions can you count in the picture…. Bob Hope and No Hope. will receive yet another £20 gift voucher on Friday…. I Feel Fall is in the Air, A Groovi Step by Step by Barbie. My oh my…I thought my table was a mess!!! Loved the shows yesterday. Rang office AGAIN to place another order..can't wait for Tues/Wednesday. .I have my friend Margaret coming to visit with her granddaughter and we are going to get in the groove! Young Myesha has had go so I am giving her a lesson and hopefully some ideas and we can do it all with you on the telly…great timing. Bet I will be ringing again with another order…looking like some more fantastic boards ! Loved the shows yesterday. Superb samples from the design teams. I will be watching tomorrow and Wednesday. Look forward to seeing Lee having a play with the Groovi system. I counted 13 but did not count all the file folde4s. 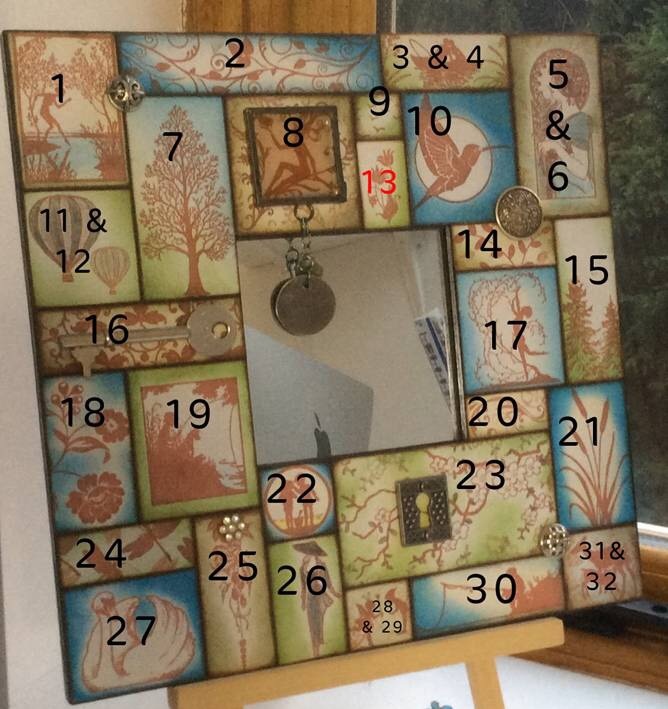 29 – bit over the top but surely nearer mine. 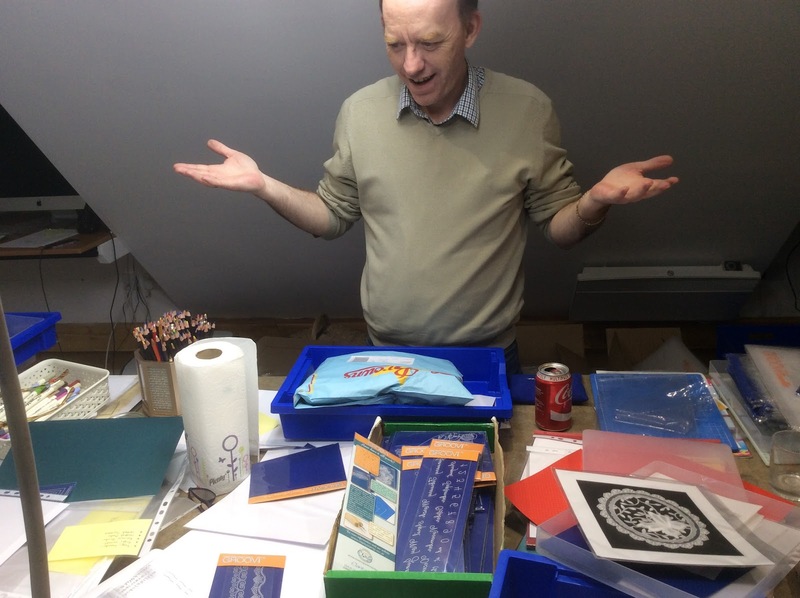 My craft room is in utter chaos – wedding invitations, christmas cards, groovi – not to mention 40 cards which I have just sold for Guide Dogs for the Blind – I am buying a dog – good said the old man, I am getting a dog. Sorry it is really the money going to buy a guide dog. All made with Clarity stamps. I am so pleased all those years ago, I found Barbara and her helpers. Best wishes to everyone – I am on a high, having done something good today, and had such pleasure in making the cards. Shows were great yesterday and I recorded them also. I have tomorrow all set to record and looking forward to the Groovi storage. Good luck for tomorrows marathon. I have no idea how many storage items there are but, obviously, not enough. Lol. I watched yesterday's shows today and would like to say how much I enjoyed the content and the format on Hochanda is fantastic. Can't count tonight, a bit 'wabbit' (tired) from clearing yet more things (craft stuff this time but not from the craft room!!!) for yet another charity bag. Taking this decluttering quite seriously but can't bear to think of trying to empty the garage. Order in a skip, I think! Onwards and outwards! Home today from a weekend visiting our newly married daughter so just watched yesterday's shows. 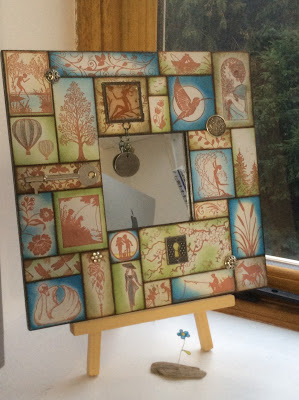 Can't wait to see the new calendar, the old one has had pride of place on one of my craft cupboard doors since I got it. I think there may be 28 storage solutions on the table, not all different ones but all capable of holding something. We can find a use for anything we crafters can't we! Looking forward to the Groovi day this week. Looking forward to seeing your one day special and your demo's of course. I think I count 18 there's probably loads more. Your table looks a bit like mine, except mine is supposed to be the dining table. I get regular sarcastic comments from my husband about our inability to eat at it. I feel like I tidy up regularly but never seems to make a dent! Ah well, as long as I'm having fun! Woo-hoo!! 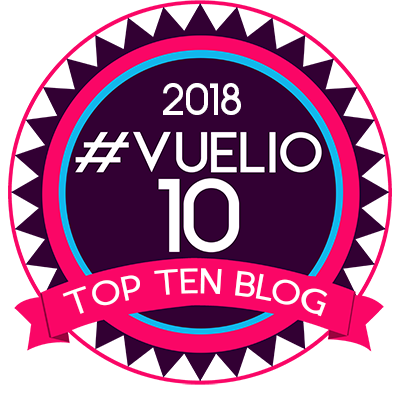 Delighted to have won the blog candy – have to say, once we'd started the count, we were determined to see it through, but it took a while … so, to answer your question, Barbara, we're pretty awful at tidying up because we get too easily sidetracked by challenges like that! But keep 'em coming, it's fun! Barbara, so enjoyed your shows yesterday. I always learn so much from you. I don't know how many organizational items you use, but definitely, they aren't working. 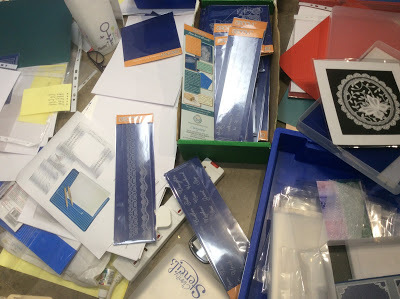 I have to keep my craft studio ultra tidy or I just can't create. I little OCD, I think. If you would like to fly me in from Canada, I would love to help organize your space. Looking forward to the new shows and seeing how you organize the Groovi System For the A5 plates, I use one of the stencil folders. It works just great as it is the perfect size. Looking for something for the long side plates though. Am sure I will be ordering the new system when I see it. Rest up as you have a busy few days coming up. Evening Donna how's your crafting going ? Oh good thought it was only me that makes a mess while crafting good job the table only gets used at birthdays and Christmas. but when I come down after a crafty night and see the mess I so wish I had a craft room like you Barbara so I could shut the door. Hi Barbara now that's what I call organised chaos ! 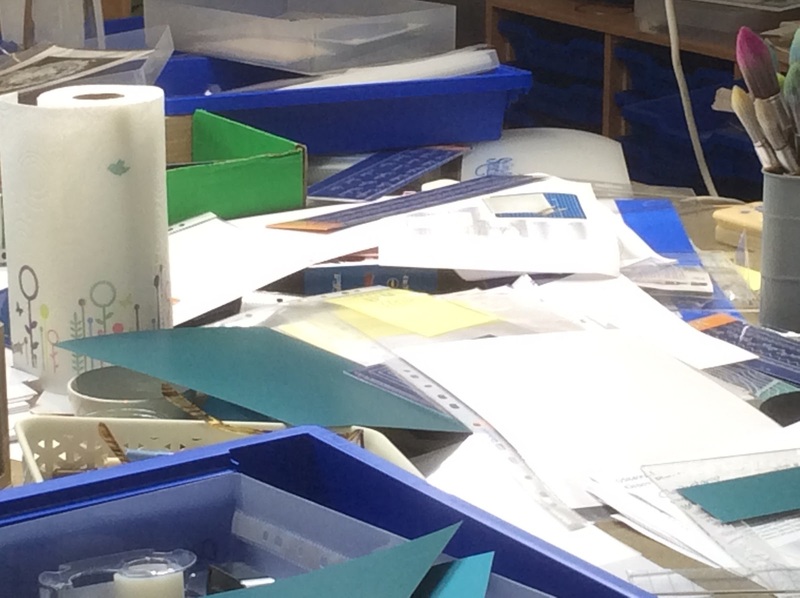 I counted 25 storage items but I'm sure there is more – I've probably only touched the surface! 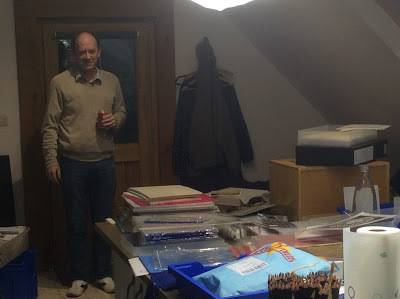 From the look on Paul's face I guess he's an organised crafter! Brenda if your looking in, we need you, it's time to get the Clarity bus on the road again, Barbara needs our help with tidying up – she may even let us near her rubbish bins! Lol. Have a good nights sleeponight and safe journey tomorrow. I love your craftroom look it is perfect and looks very much like mine! They only thing is I don't have storage systems on my work surface!!! I think the number is 28 please don't ask me how I got that number as I can't remember now lol.
. problably wrong but thats my count. I'll guess 26 but sure there'll be more buried on there! sorry, need to up my guess to 29, forgot the drawers for one thing! Well, I have no idea, so am going to guess at lucky 13 ! 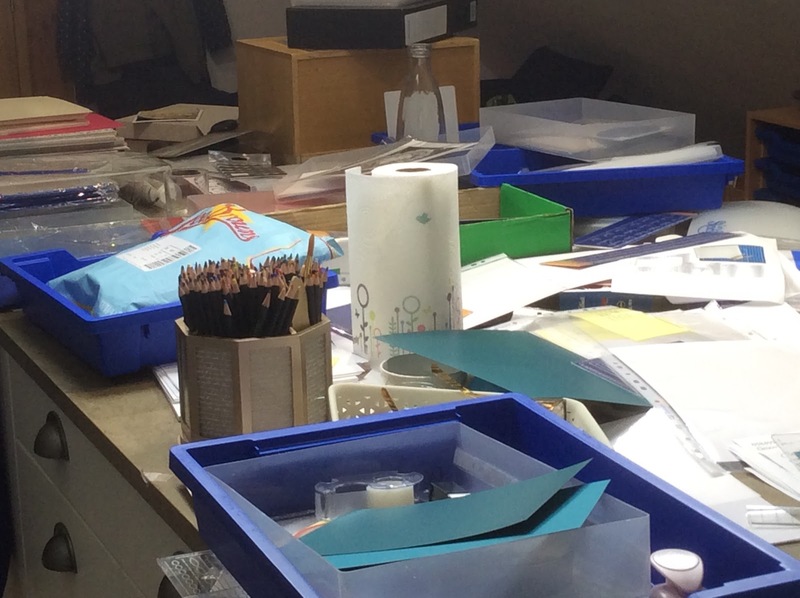 I have also pinched the pencil pot idea for the Spectrum Noirs – I bought a kitchen sink cutlery tidy with three compartments, I can keep the well used and smaller in size pencils in the lowest section of the three ! Just wish I had the space to put it!! p.s. forgot to say well done to Dawn and her Mum, you sound very organised and that reminds me I did once start a spread sheet but think I have a lot more to add to it !! I'm trying my luck with 24! Wonderful Hochanda show this evening!